Hi ladies! I have for you today a review on a product I have been using almost every day for the last 2 months with great results but have been so bad to not review earlier! My hair has never been perfect and now that I get foils regularly it's not in the best condition unfortunately. Besides frizziness I had absolutely TERRIBLE hair fall out. My hairdresser always tells me that it's natural to lose about 100 hairs a day but I definitely lost a lot more. After I wash my hair I'd pull out strands of hair and I'd need to vacuum my bathroom at least once every two days due to all the hairs on the floor! So when I was offered the chance to try Activancet hair stimulant I jumped at the opportunity. "The latest development in hair cosmeceuticals, this is the only stabilised hair treatment in the world that contains the vital nutrient Rhodanide found in egg yolks. 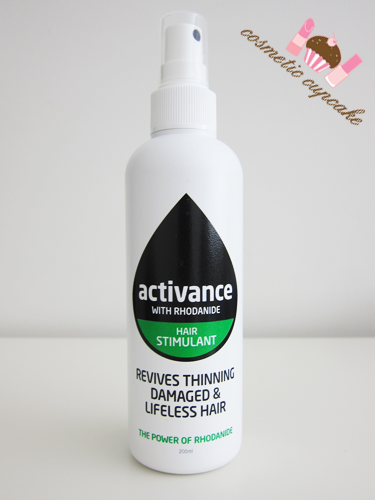 Activance both prevents and helps to remedy the problems of thinning and damaged hair.. it treats the damage caused by everyday colouring and styling, allowing you to love the latest hairstyles while keeping your hair healthy and full." 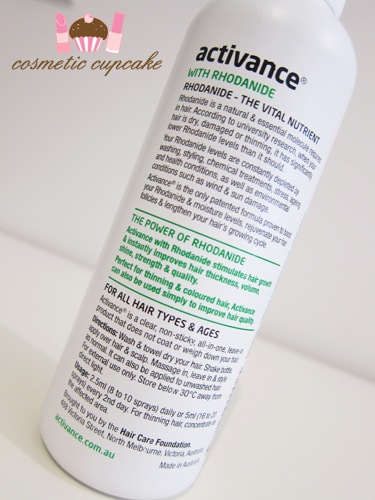 Activance works by boosting Rhodanide levels in your hair which are constantly depleted by washing, blow drying, chemical treatments, stress, health, drugs and medicines, age and environmental factors. It does this by increasing hair moisture by 50% and strengthening your hair and improving hair growth, volume, shine, elasticity, strength and manageability. It comes in a handy spray bottle and the clear all-in-one leave in formula is non-sticky (I really don't like when a product leaves my hair sticky!) which is great. It smells lovely and can be used on both washed and unwashed hair. I usually wash and towel dry my hair and since I have long hair I use about 10 sprays and then massage it in. Overall: After using Activance for over 2 months, my hair feels and looks noticeably healthier and stronger and is less frizzy. Most importantly for me I've experienced much less hair loss. Of course I still lose hairs but it's nowhere near as many as I used to!! With continued use as well I'm hoping my hair loss will continue to reduce. I noticed a difference in my hair after only a few short weeks of use too. The price may be a tad on the pricey side for some however the bottle should last a long time as you don't need that many sprays per application and is well worth the price in my opinion. Would I repurchase: A product that will help reduce my hair fall out? HECK YES I'll be repurchasing!! Details: Activance retails for $55 for a 200ml bottle and is available Australia wide. Visit the Activance website or call (03) 9326 8844 for your local stockists. A big thank you to Camilla for sending me the above product to sample! I was sent the above product for my consideration but this in no way influenced my review in any way. As always, my reviews are my 100% honest opinion. This sounds like something for me. Like you, I lose much more than 100 hairs/day! After a blow dry & comb through, I need to clean the bathroom floor EVERYTIME. I have frizzy, escaping hair too! I might have to give this a go. And also get a trim this week, my ends are awful. Is this also outside Australia available? @Julie: It's so gross having hair all over the floor! =( I'd suggest giving it a try, I get SO much less hair loss these days. Just a few strands each time instead of tonnes! @Monika: I feel your pain Monika! I've never heard of Vichiy but too bad it's not working for you. Let me know how you go ordering it from Catwalk.com.au!